To evaluate the accuracy of biopsy grading in a cohort of contemporary robot assisted radical prostatectomy (RARP) cases, comparing between different centers of diagnosis. On this cohort we focus on clinically significant upgrading (CSU) and specimen confined disease (SCD) as the primary outcomes. Comparison of parameters defining low risk prostate cancer(LRPC). All radical prostatectomy patients in our center from 2009 to 2015 were included in this retrospective analysis. Staging was assigned by the treating urologist. Prostatectomy specimens were processed according to the Stanford protocol, while grading followed the revised Gleason score (GS). CSU was defined as upstaging from biopsy GS ≤6 to pathology GS ≥4+3. SCD was defined as pT2-T3a, node negative and negative surgical margins. Criteria used for LRPC were GS ≤6, PSA <10, ≤cT2aN0M0, ≤ 2 positive cores. We analyzed 456 consecutive patients and classified them by preoperative criteria used for defining low risk prostate cancer. 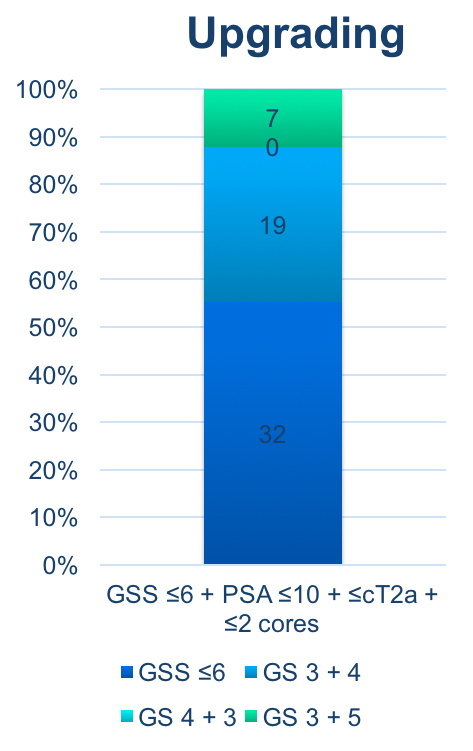 A total of 171 patients were diagnosed with a biopsy GS ≤6, with a mean iPSA of 7,7ng/ml and 9,1 biopsies on average. 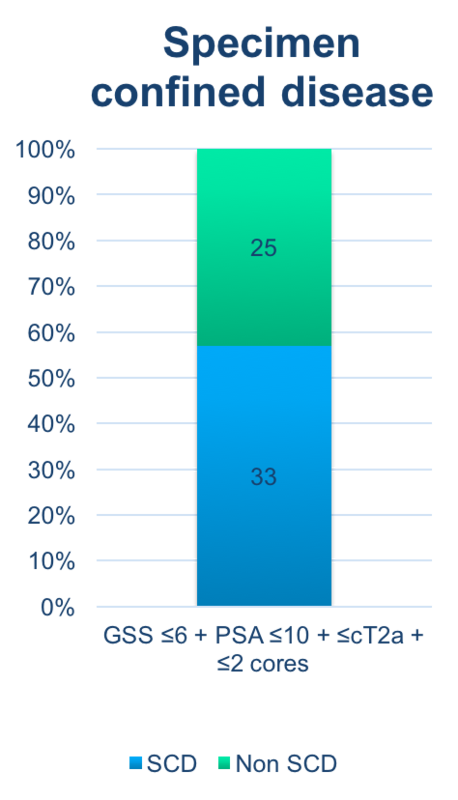 CSU was present in 21(12.3%) of these patients. When considering LRPC patients, 7 out of 58 (12.1%) patients were significantly upgraded, and 25 (43.1%) had non-SCD. 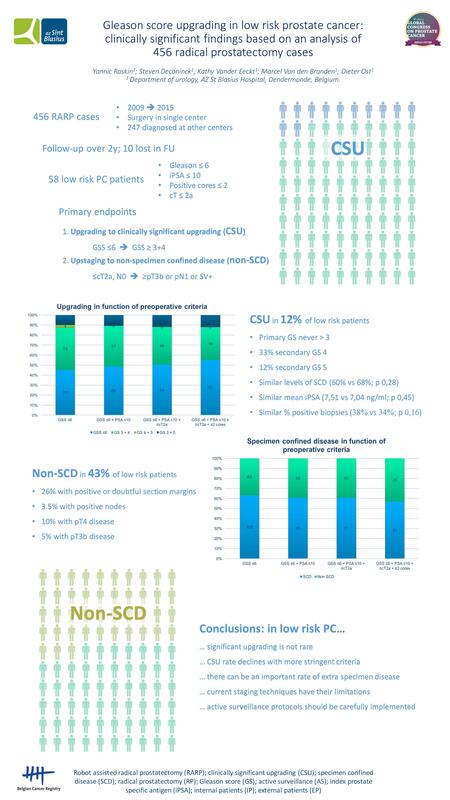 In upgraded patients, we noted similar levels of SCD (60% vs 68%; p 0,28), mean iPSA (7,51 vs 7,04 ng/ml; p 0,45) and percentage of positive biopsies (38% vs 34%; p 0,16). Clinically significant upgrading is not rare but has important clinical implications. In our series this was the case in 12 percent of Gleason 6 RP cases. This rate was not lower when using LRPC criteria. Prognosis was worse for these patients, considering the higher GS and higher rate of non-SCD. The correlation between SCD and overall survival has clearly been stated before. Based on current criteria for AS, a considerable amount of our patients would have been undertreated or delayed in active treatment. Off course our cohort has an important selection bias in selecting GS ≤6 for RARP as the current guidelines were considered in patient selection and counseling.